I don’t drink coffee so when we go to Starbucks I usually get a frappucino. CSP gets to take his big reusable coffee travel mugs to Starbucks, but I didn’t have anything suitable for my cold drinks. 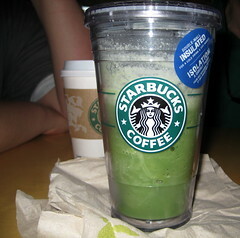 So when Jenny blogged or tweeted or something about finding this fabulous reusable tumbler at Starbucks I was so psyched! Until I couldn’t find them. ANYWHERE. I called every Starbucks in my area, my mom’s town, the ones near CSP’s work, everywhere. I heard the same story “They sell out as soon as we get them.” These things are so hot they are even being sold for astronomical prices on eBay! Well I am not about to pay more than retail! So today we spent the day with my in-laws. Breakfast and shopping at IKEA, picking up dinner fixins at Trader Joe’s, buying our new clothes washer at Sears, etc. FIL suggested we stop off at Starbucks after Sears for coffee. We walked in and there, in all their glory: the coveted double walled, insulated, reusable cold tumblers! The skies parted and the beverage gods smiled down upon me! There were only a few and only in the grande size. I scooped one up and they filled it up with green tea frappucino. Yum. I feel so much more responsible now. LOVE this tumbler. No sweating since it’s double walled. Plus the drinks stay cold longer. I’ve never seen Starbucks offer anything like this. I bet this won’t be the last summer they sell this tumbler. Comes with a permanent straw too. So cute! I’ll be sure to keep it with my reusable shopping bags so every time I go out and about I’ll be prepared! I use those reusable shopping bags and I’m always forgetting to take them into the grocery store with me. I’m bad! I have a ton of resuable shopping bags from all over! lol The walmart bags are the best because they are HUGE! I also have one of those tumblers, mine is solid blue and I keep it at work for my water and juice lol..
Love the title of this entry. 🙂 I’ll definitely have to check those out! Awesome! LOVE green tea fraps. Oooh, I wanted one of those but I don’t like permanent straws because I don’t know how to clean them. This is where my green and germaphobe worlds would collide! Worlds collide! ha! I hand wash my tumbler, lid & straw. Then I pour hydrogen peroxide down the straw, then really really hot water. You could use disposable straws though.